As of this writing there have been no arrests made, no persons of interest announced by authorities and no terrorist organizations claiming responsibility for Monday's Boston Marathon bombings which killed three people (including an 8-year-old boy) and injured more than 100. The powerful blast left Boylston Street resembling a bloodied, limb-strewn war-zone, and sent shockwaves through this New England city and across the nation. 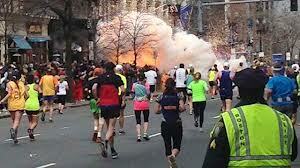 The carnage, even for seasoned first responders, was horrific. The attack was a stunning surprise. No prior warnings had been received nor had the typical pre-attack terrorist cell chatter been evident, according to law enforcement and homeland security spokespeople. The two devastating explosions quickly turned the city's annual Patriot's Day celebration into a tainted landscape of shrapnel, fear and death. The city, the marathon and Americans everywhere have been dealt a terrible blow, which brings right back to the surface the chilling events of September 11, 2001. It's been twelve years since the horrifying 9/11 attacks which killed 3000 in New York City, Washington, DC and Pennsylvania. Since then the country's been lulled into a false sense of security. With no further attacks, the intense fear and anxiety of that period subsided after a few short years, leaving Americans feeling relatively safe and secure. To be sure, Monday's attack in Boston serves as a tragic reminder of our collective vulnerability. It's making us painfully aware of the risks we face in this ugly new world simply by being a runner, a Marathon watcher, a parade-goer... or perhaps by one day being in a grocery store, movie theater, nightclub, sports arena, school, office building, subway or airport when a terrorist--domestic or international--will decide to send a sick, ghastly message. We now must accept the reality that more bombings are likely. Maybe not today or tomorrow, but in the not-too-distant-future. Those who commit acts of terror don't need much to bring a neighborhood, a city and even the nation to its knees. Will America eventually become like Israel, whose hardened citizens face each day knowing it could very well be their last at the hands of a terrorist and his explosives-filled backpack? While it certainly doesn't lessen the impact of Monday's tragedy, let's hope that it was an isolated, non-political crime committed by a lone-wolf wacko who was off his meds and angry at his former employer. Maybe that will be easier to accept. But it doesn't change our new reality of how some people now vent their hatred and rage. In the end, while it doesn't matter whether it's a Taliban-supported al-Qaeda cell or an unaffiliated malcontent, our ultimate fear and loss of innocence, is just the same.